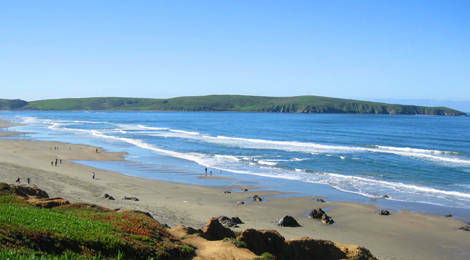 I just returned from a wonderful weekend at the beach with some other bloggers-turned-dear-friends, where we shared a gorgeous beach house along the Marin County coast. So…I have beachy things on the brain! 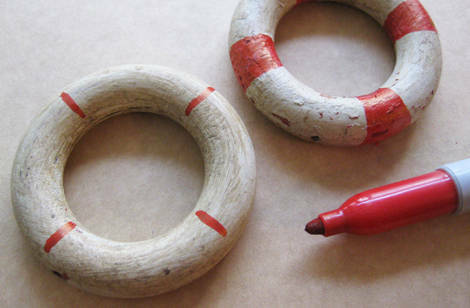 I’ve been hanging onto some vintage wooden drapery rings (aka: curtain rings) and thought of a cute and easy project to share. 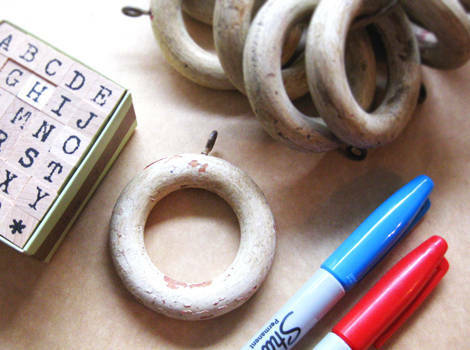 Vintage wooden drapery rings are easy to find on Etsy, eBay, antique shops and thrift stores. The chunkier the better. New rings will work fine as well, however they tend to be a big skinnier. Mine were already painted, but if you find some that are darker, just give them a good coat of white or off-white spray paint. I removed the eye-screws and made marks at each quarter of the rings as guides and then colored in sections, narrow at the ring center growing wider towards the outer edge and continuing to the other side. 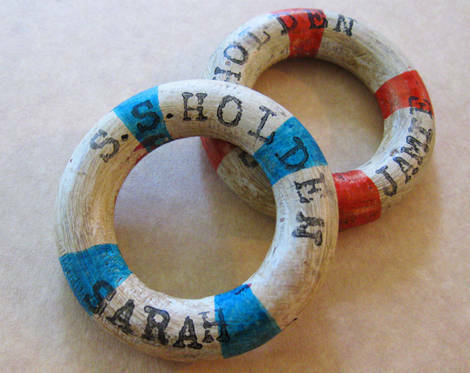 I marked each with S.S. HOLDEN and my kids’ names on blue and red banded rings. After drying, it’s a good idea to coat them with satin finish acrylic spray. 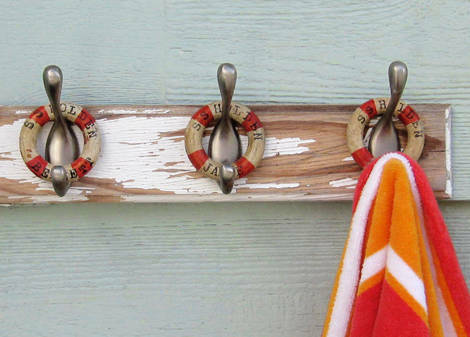 The red banded lifesavers will hang outside for beach towels. The blue banded ones will hang in the kids’ bathroom for bath towels. Drapery ring lifesavers would also be cute as ornaments, gift embellishments, picture frame embellishments, beach house key rings and more! This entry was posted in Decorating, general craft, repurposing. Bookmark the permalink. What a WONDERFUL idea! I love them. I’m on the lookout for some drapery rings. This is a great idea! They could also be used as napkin rings! We use cloth napkins and try to reuse before laundering if possible, this would be a great way to keep each child’s napkin marked! 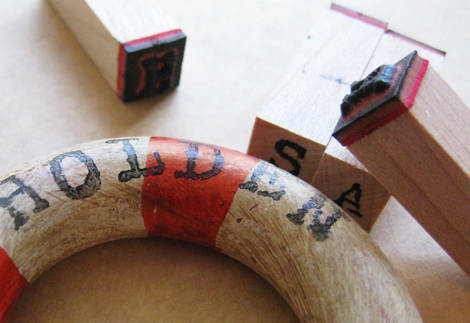 they’d make awesome napkin rings, too! those are really cute! I love these! Napkin rings definitely (or even tying onto a “theme” gift box). Can’t wait to see what other beach-y things you’ve got up your sleeves! what a clever and cute way to keep track of towels and whose is whose?! just something you made – smarter, better, prettier! I LOVE LOVE LOVE LOVE these! I just ordered myself some! Thank You so VERY MUCH for the idea!!! How cute! I love this idea! They look fantastic! Those are toooo cute, what a great creative idea. Perfect for the summer season. I just met my first blog friend in person and did a post on are bloggers the same in person? She sure was! Save me! I may be drowning in *cute*! Love your darling idea Cathe! Bring on the summer! Clever… and such a fun idea! I don’t know how you come up with some of these ideas..these are adorable! Love them as the markers for the towels. Brilliant, brilliant as usual. You rocked this idea! Very creative! If you used the rings that have clips you could use them as weights to keep the tablecloth down when dining outside. Or with a clip of some sort, as zipper pull charms on hoodies or gym bags. Since they aren’t that big, could you use clear nail polish as a sealer? These was very nice.. think I have to make some of these! L.O.V.E.- love, love, love these!!! Oh my goodness! This is such a wonderful idea!!!! I’m totally stealing it! What a great idea for a hostess gift also! These are adorable and will make fun decorations up at our lake house. Thanks for sharing this idea! I’m new to this, and I’m so glad I added you to my web blog! It brings me your wonderful ideas so easily! Havin fun! Love this awesome idea! Can’t wait for it to warm up here in the PNW! um,um,um, you never cease to amaze me with your imagination. Cathe, you never cease to amaze me. Way to go! Cathe, while you’re sick?! Really???!!!! You slay me. I love these! I love them! What a clever idea. Do you mind telling who makes that alphabet stamp set? those are very cute! i have a box of identical rings. the beach theme isn’t my thing, but perhaps i’ll finally do something with them now. Oh my goodness. Those tiny life preservers could not be any more awesome if they were floating in the ocean! Another awesome project Cathe!! What a great idea! I can think of another way to use the curtain rings. I’ve been looking for something that small to use as a miniature embroidery hoop in a shadowbox, to display a scrap of fabric with some childhood embroidery on it. 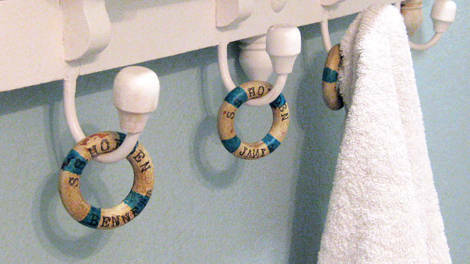 I had been considering a small wooden letter “O” but a curtain ring would be just the right size. Very inspiring. Cathe, I have a bag full of the exact same rings, and I’m thinking napkin rings for a summer table would be adorable. Thanks for the great idea! These are amazing! So easy to make and such a good result. I have a lot of those drapery rings at home and this will definitely be a good way of reusing them! omgosh that is sooooooooo adorable!! LOVE IT! Oh, how creative!!!! I really like this idea!! These are really cute – would make great napkin rings that could also be used as placecards…if the names of the guests were on the top of the ring….I love your wonderful ideas! What a neat idea! I linked this to my nautical post too, for inspiration! I surely wish I would have known about this a year ago Feb. I SO would have made them. My friend designed a Murder mystery Party based on “The Titanic” one of the BEST Nights of my life………These are ADORABLE!!!! They would make great napkin rings. what an awesome idea. i never wouldve thought of that! I’m doing a US Coast Guard promotion party for my husband. Thanks for the GREAT ideas!!! Christmas ornaments, with the year along the bottom! This is brilliant and I’m pinning! Thanks for the idea. Cathe — I liked this idea so much I included a photo of it and a link to your site on my blog today. I wrote about diy napkin rings suitable for home staging. Yours are adorable! I hope some of my readers will become your regular readers. Love this for napkins rings. Any other nautical ideas up your sleeve?Thanks.